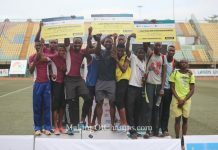 Nigerian athletes ushered in the 2019 outdoor season under the scorching sun that licked hard at the Otunba Dipo Dina International Stadium – venue of the Athletics Federation of Nigeria All-Comers Meet, on Friday, April 5th. 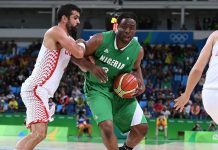 Enoch Adegoke was the man to beat in the men’s 100m as he clocked a time of 10.62s to win the final after he bossed affairs in his preliminary heat. 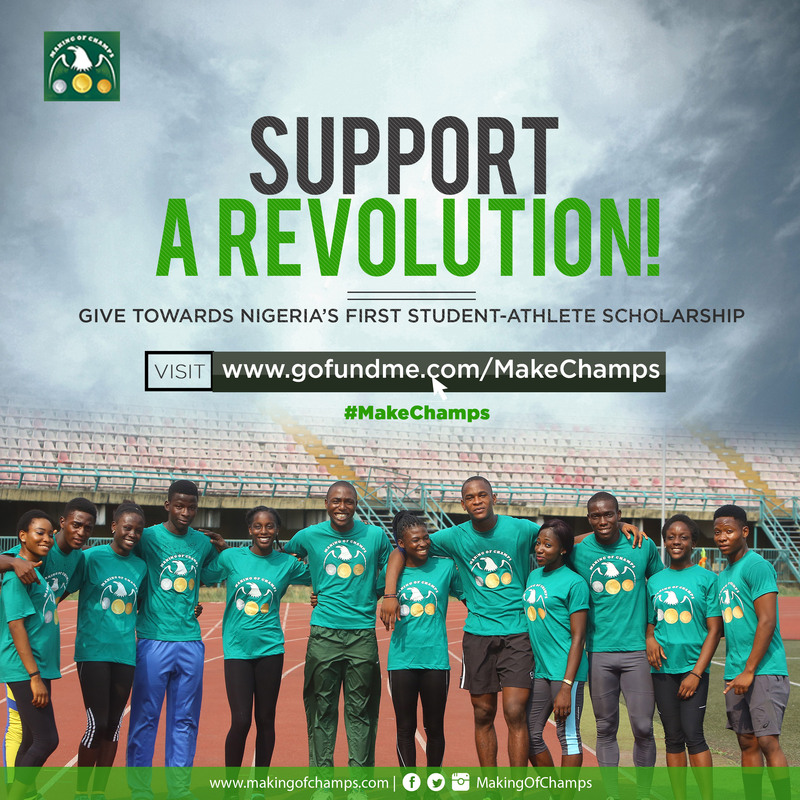 Making of Champions (MoC) athlete and Shell-sponsored Emmanuel Ojeli who is best known as a quartermiler finished 2nd in 10.78s, after running a Personal Best (PB) of 10.61s to qualify, while Alaba Akintola settled for 3rd in 10.82s. 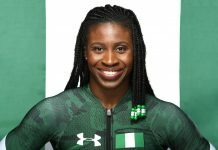 Rosemary Chukwuma vanquished her rivals right out of the first lane in the women’s 100m final, hitting the finish line in 11.87s into a headwind of -2.0m/s while Marvelous Asemota finished 2nd in 12.05s to Esther Okon’s 12.21s for 3rd place. 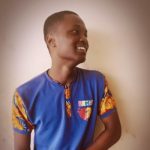 There were also some good times in the men’s 200m with the best of them all coming in the shape of Jeremiah Jakpa’s 21.23s run to win the second heat of the event. 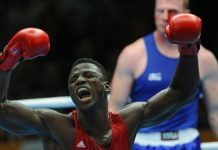 Adegoke also competed in the last heat which he won in 21.26s while Emmanuel Arowolo took Heat 4 in 21.55s. 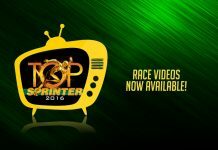 Praise Idamadudu was the fastest woman across all heats of the women’s 200m, winning the second in 24.12s (-0.9) as Joy Udo-Gabriel dominated Heat 1 in 24.44s (-1.8), while Anita Taviore posted 24.47s to take the final heat. Samson Nathaniel finished head and shoulders above his rivals in the 400m as he won his heat in 46.96s with Isah Salihu in 2nd, while Adeyemi Sikiru was in control of Heat 3 where he clocked a time of 47.14s. 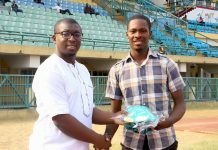 Abdulrahman Afeez clocked a time of 47.29s ahead of Shedrack Akpeki and Gracious Ushie of MoC who ran a PB of 48.69s in the second heat. Ifunanya Muoghalu dominated Heat 1 of the women’s 400m in 55.74s, Blessing Ovwighonadjebre topped the following heat in 55.99s while Funke Ogunbase came through in the final heat with a 54.79s clocking to finish 1st with the overall fastest time in the women’s 400m. Efe Favour held off stiff competition in the women’s 100m Hurdles to eventually come away a clear winner in 14.95s ahead of Victoria Adunbi (15.20s). MoC’s Glory Nyenke finished 3rd in 15.50s. The men’s 110m Hurdles had Yusuf Mohammed clear the barriers and finish the race ahead of Wisdom Musa in 14.92s as the latter clocked 15.05s. 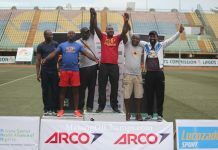 The men’s 400m Hurdles was won by Henry Okorie in 51.88s. 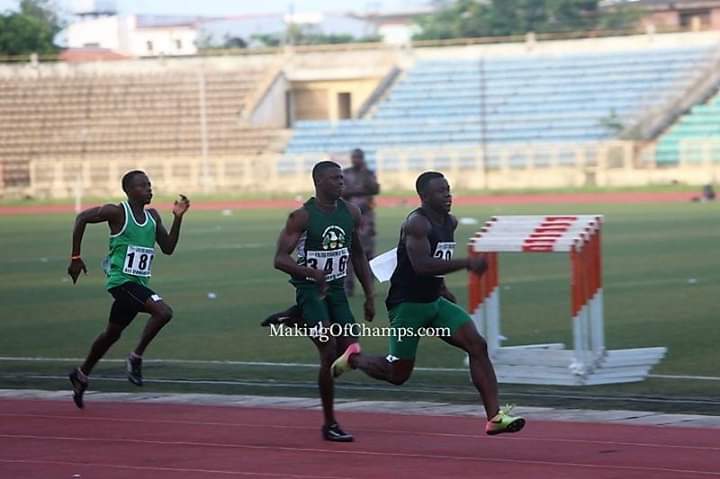 Prior Ochonogor (52.85s) and Gbenga Bakare (52.87s) were 2nd and 3rd respectively, while Adeyemi Sikiru came out tops in his own heat with a time of 54.13s, with Teslim Oyedele in 2nd in 55.30s. 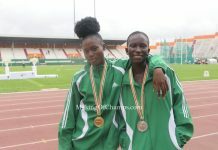 Joy Abu (60.78s) and Sarah Kadiri (61.48s) were the winners of the two heats of the women’s version. Victory George won the women’s Long Jump with a best leap of 5.87m. 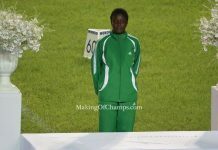 Patience Okoronkwo reached 5.80m at her best while Amarachukwu Obi jumped 5.67m to finish 3rd. 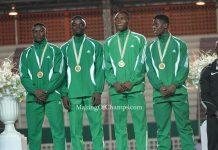 Afoke Oshasha broke the sand at 7.43m to confidently win the men’s Long Jump ahead of Bode Akintokun who jumped 7.19m, while Omo Erhanyanmen reached 7.00m for 3rd.